Scientists have found a simple way to disassociate feelings of fear from the memory of a fearful situation, with potential applications for treating psychological problems. Stressful and scary situations such as war or accidents leave fearful memories imprinted in our brains. As these memories surface again they can cause big problems for people in the form of conditions such as post-traumatic stress disorder, or PTSD. Writing in the journal Science this week, Thomas Agren and his colleagues at Uppsala University in Sweden have taken a big step forward in understanding how fearful memories get processed in the brain, which could potentially lead to new ways to tackle the problems they cause. This new paper builds on a lot of previous research that's been done in rodents, which showed that you could erase fearful memories in these animals. But now the team have looked in detail at fear memories in humans. The key lies in understanding how the brain processes fear memories after a scary event, and particularly what happens when a fearful memory resurfaces - for example, a soldier having a flashback to a bomb attack. At this point the brain can change the memory, before it's stored again, which is a process called reconsolidation. And this seems to be a crucial time for intervening to actually erase the memory, getting rid of it for good. 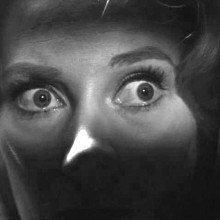 The scientists used a well-established psychology technique to give people fearful memories, called fear conditioning. They showed 22 volunteers an image on a computer screen and gave them a mild electric shock. The next day, they showed the image to them again without giving them a shock, and found it triggered a fearful memory of the previous day's shock, as measured by changes in their behaviour as well as nervous reactions such as sweating. This reactivation of the memory is the reconsolidation I mentioned earlier. The researchers then split the group of volunteers in half. For one half, they repeatedly showed them the image just 10 minutes after they had reactivated their fear memory - what they call extinction treatment. This is still within the time period when the brain is reconsolidating the memory. For the other half, they showed them the image again 6 hours later, outside the reconsolidation window. They found that for the first group, they had stopped associating the image with the fearful memory - it had effectively been wiped out. But for the group who got this treatment 6 hours later, they still had a fear response to the image. The researchers think that a part of the brain called the amygdala is responsible for storing and recalling fear memories - to test this they brought the volunteers back three days later and put them in a brain scanner, then showed them the same trigger image. The group that had been given the extinction treatment six hours later showed activity in their amygdalas linked to the fear memory, but no similar activity was seen in the group who got the treatment just ten minutes later. At the moment this is a very small study, using highly artificial conditions. But the researchers have shown that they can intervene during reconsolidation of fearful memories, and that this can help to get rid of them. Although we're a long way from having a technique that doctors can use, it's the first time that this kind of approach has been shown to work in people, so an important step in the right direction. 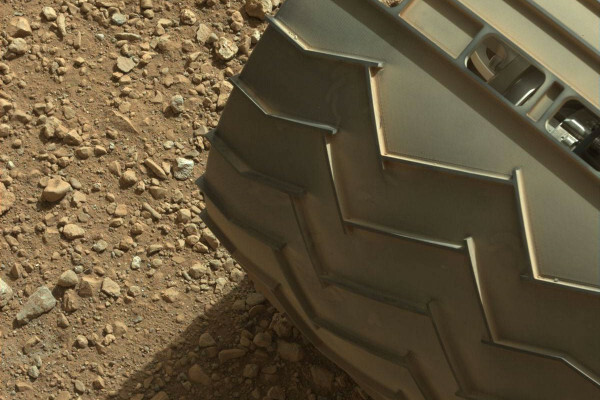 The drill bits which the Curiosity rover will use to examine Martian rocks may be contaminated with Earth life. Scientists working on the Mars rover Opportunity are hoping that it doesn't find water on its exploration. This is very surprising as as one of the major goals of NASA's Mars exploration is to understand water on the Martian surface and possibly ultimately find some form of life there.
' 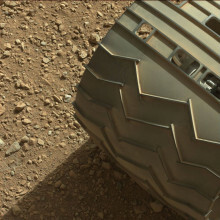 alt='Curiosity's Arm' >The problem is that there is a very large chance of finding life which isn't Martian. Lichens from Earth can survive exposure to the vacuum and radiation of space, and that some kinds of bacteria can live in the Martian atmosphere and environment. This raises the hopes for finding Martian life, but it also means that we have to be extremely careful to avoid contamination of Mars. 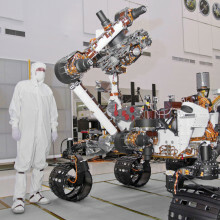 NASA have strict rules about sterilising anything which might touch the Martian surface, but 6 months before the mission launched, the box holding the rover's rock drill was opened to preload a drill bit, making the system more likely to work despite damage from vibrations in reentry. There wasn't time to resteralise the drills so there will probably be some bacterial spores inside. The present situation is that the bacteria definitely won't be able to grow if they don't find water, so as long as Curiosity doesn't find water or ice it can carry on its mission. But if it does it won't be allowed to use its drill, severely reducing what it can learn from the rocks of Mars. Fortunately, the rover is in the equatorial part of Mars, where it is unlikely that water will be present. 10:56 - The IgNobel Prize for "Hairodynamics"
The IgNobel Prize for "Hairodynamics"
Chris - So, what was the award for? What did you do to win your Ig Nobel? Ray - Well, the award was given to two separate groups. The first, myself in collaboration with Patrick Warren a Research Scientist at Unilever Research and Robin Ball, Physicist at the University of Warwick for explaining the shape of a ponytail. And the second half of the prize went to Professor Joe Keller at Stanford University who explained the swing of a ponytail. Chris - Why? I mean, is this a big problem? It must be of someone like you who's working on it. Ray - Well, the genesis of half of the prize work is really at the Unilever research labs in the UK. As you know, Unilever is a global manufacturer of personal care products including shampoos and conditioners. And for obvious reasons therefore, they have great interest in the properties of hair and for a number of years, scientists including Patrick at Unilever had been trying to understand difficult problems involving say, the tangling of hair and in general, understanding the properties of bundles of hair as in a ponytail. And they reached out to me several years ago to join their team to help them solve these kinds of problems. Now I have to say, when I was first contacted by them, just like with the Ig Nobel Prize, I first laughed hilariously. I actually thought this was a Nigerian email scam or something like that, but I simply begun to realise that there was very interesting physics there and on my first visit to Unilever, a bunch of us were sitting around the table and they were explaining to me these scientific questions they were after. And we were given what are called hair swatches which are commercial bundles of hair that are used to test shampoo and conditioner. They're about 25 centimetres long, they have about 10,000 hairs and they're clamped at the top, and so in fact, if you hold them vertically, it looks like a ponytail. And in trying to figure out how to get into this project, there was understanding the properties of large numbers of hairs, we realised that actually, the shape of the ponytail was the right testing ground. That is, if we couldn't solve that problem and understand something that seems as simple as that then we couldn't go any further. So, we set ourselves the task of trying to explain the shape of a ponytail. Chris - Is it tricky? Because when you're dealing with a ponytail and you have lots of individual hairs and they all have their own behaviour as a material, and they're all interacting with each other which means that there's not just one type of behaviour, the individual hair. 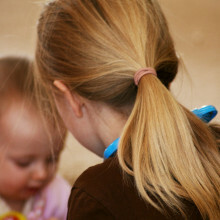 It's the behaviour and how that behaviour influences the behaviour of all the other components in the ponytail. Chris - The hair comes in lots of different flavours, doesn't it? Or at least you've got people who have Chinese hair which tends to be quite different in characteristics than people who are say, blonde and have that very fine wispy hair like my son for example. So, does the equation have a component or parameter that accounts for that ethnicity? Ray - Exactly. It turns out that this pressure, the magnitude of this pressure and the scale of radius of the ponytail at which the pressure disappears is very crucially dependent on the average squared curvature of the filaments and their stiffness. So, it's basically like a spring. Ifyou have a curly piece of hair and you would flatten it between two sheets, you'll have to do work to compress it. And so, the more curly the hair, the more work you have to do, the greater the pressure pushing out. So in principle, there's a way of sort of cataloguing different types of hair by the pressure with which they push out of a bundle. Chris - Does that mean then that now, if you take that equation, you can model hair much more accurately? And so, computer games designers, people making Hollywood movies where they don't want to pay extras, they can pay a computer instead who can make much more lifelike and realistic renditions of hair, which I understand has always been a major headache right now. Ray - It has been a major headache, absolutely, and there are lots of groups that have made wonderful progress on this including a particular interesting work in Paris. But the incorporation of this bundle effect is something which we think could be an exciting new twist on this that could actually make things much more realistic. And we hope in the future, to be able to think about that, as well as about what might be called the hairodynamics problem. That is how hair interacts with hair flow as in when you wave your head or you're in the wind. Chris - So how did this go down in front of the Ig Nobel ceremony? You have about 1 ½ minutes to tell the story, didn't you? Ray - Yes. Well in fact, since there were two parts of the prize, we just had 30 seconds. So, we distilled it down to the essence. In fact, we joked about this on 2012, the search for understanding deep properties of the universe was partially successful in the sense that the Higgs Boson appears to be found and of course, that's supposed to be the explanation for the origin of mass, and we have to come up with an explanation for the origin of volume. In this week's NewsFlash, we find a new, neurological cause for overeating, a fast and cheap paper-based test for liver toxicity, a silicon-based breakthrough in quantum computing and we find out how bees find the most efficient paths between flowers. Alan - Rats consume twice as much chocolate as they would normally eat when the concentration of an opium-like chemical is increased in a part of a rat's brain that wasn't previously thought to be linked with hunger say researchers at the University of Michigan. 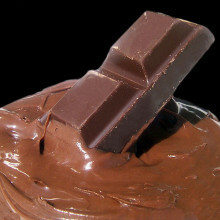 Levels of a naturally-produced chemical called enkephalin increased markedly when the rats started eating the chocolate. To find out whether the increased enkephalin levels caused the over-eating or were simply a product of it, the researchers stimulated the same brain area with another opium-like chemical. This caused the rats to eat 17 g of chocolate in one hour, the equivalent of consuming 3 and a half kilograms of chocolate for the average human. Alexandra - One of the hallmarks of addiction and what makes it kind of odd is that, addicts over and over will say that they don't enjoy the drug as much and that they want to quit, they don't like the drug experience as much anymore, they don't find it as pleasurable. And as that pleasure decreases, at the same time, the wanting and the motivation for the drug is increasing. And so here, we've found a brain area where those two are split apart - you don't have this increase in liking, but you do have this increase in wanting. Alan - HIV medication can lead to increased liver toxicity and a test for liver toxicity that requires only a drop of blood and some specially designed paper, has been developed by Diagnostics for All, a company working in collaboration with scientists at the Beth Israel Medical Centre in Boston. The paper changes colour when exposed to two enzymes present in blood plasma, similar to the way litmus paper reacts in the presence of an acid or alkali. Higher concentrations of these enzymes mean a greater chance of liver toxicity. Jason - We compared the test to a state-of-the-art instrument that costs hundred thousands of dollars and is located in modern hospitals. While that instrument is certainly more accurate, in the sense that it can measure the enzymes to a finer degree, in the ability to place a sample in these ranges of normal, elevated to highly elevated, we found that our device could do that with 90% accuracy. Alan - The work was published in Science Translational Medicine. Quantum computers attempt to use the principles of quantum mechanics to create much faster computers and until now they had been created using such exotic systems as photons of light. On a computer bits are the ones and zeros that are used to store data and do calculations. Scientists have now created an equivalent quantum bit, using the same techniques as the current, silicon-based computer industry. Researchers at the University of Sydney were able to read from and, for the first time, write information onto a single electron, on a single atom of phosphorus, attached to a specially engineered piece of silicon. Alan - And finally, bees are well-known for their ability to find the most efficient paths between flowers and now scientists at the Queen Mary University of London and Rothamsted Research, have observed and simulated how they do this outside the lab. This research could have applications to the way autonomous robots travel in the future. The team set up five artificial flowers fifty metres apart, arranged in a pentagon and observed the order in which the bees visited the flowers, by fitting the bees with small radar transponders. The bees began with long and complex routes, with multiple visits to empty flowers. However, after trying around 20 routes out of a possible 120, they optimized their paths. Mathieu - The bees do not try all the solutions. Instead, by being smart, they can find the shortest possible routes efficiently, with very little cognitive abilities. Next What shape web does a spider spin in space?